The best-laid plans of mice and men... don't mean squat if Marvel editorial changes it mind again. 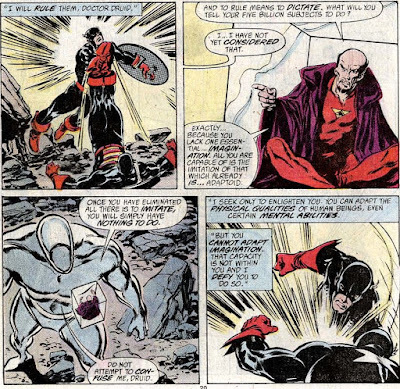 In late 1987, Avengers editor Mark Gruenwald wanted writer Roger Stern to alter his ongoing storylines. When Stern refused, he was fired and replaced with Ralph Macchio who did editorial's bidding. Druid turned out to be just what the doctor ordered.
" The FIX is on!" Working from Stern's original plot Macchio was tasked to turn the book towards the status quo preferred by Gruenwald and, more specifically, Marvel's new editor-in-chief Tom DeFalco who was far more conservative than his predecessor Jim Shooter. In Tom's mind, the readers didn't want drastic, permanent changes or new, bold directions, they merely preferred the "illusion of change". That's why he he reportedly hated Steve Englehart's new Fantastic Four and that's also why he and Gruenwald decided Captain America had to return as Avengers chairman. 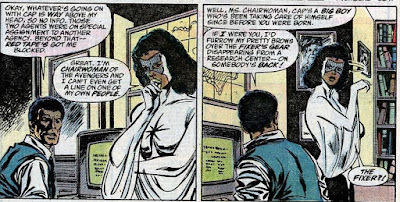 To do so, Stern was to start writing the current chairperson, Monica Rambeau, as incapable. Stern refused to defame a character he'd created back in 1982 and had shepherded along for years. That's why the unenviable character assassination job fell to Ralph Macchio, who used to write Marvel Two-in-One with Gruenwald before turning mostly to fulltime editing. Still, he did a more than passable job as he proved with Avengers I#286, appropriately titled "the fix is on". Read the opening captions, it's immediately clear Druid is not to be trusted. He's shamelessly using his astral form to eavesdrop on his teammates for... unknown reasons. "Doctor Druid! You summoned us?! Why?" Why indeed... We're barely ten pages in and Macchio starts asserting Doctor Druid as a far more capable leader than Captain Marvel who at the time Druid sounded the alarm wasn't even on Hydrobase. Instead, she was visiting with FBI agent Derek Freeman, her semi-boyfriend, to see if he knew why the government was after Captain America who'd all but disappeared following the team's return from Olympus. Great, I'm chairwoman of the Avengers and I can't even get a line on one of my own people." 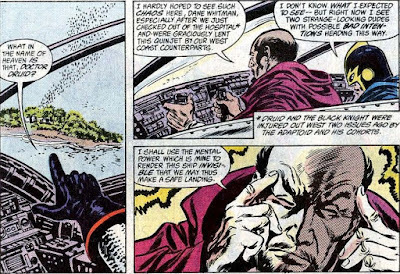 "You're up to something, Doctor..."
It seems obvious that John Buscema had finished drawing Avengers I#286 before Stern was fired. Had he stayed on, a few dialogue changes would have told a very different story. Take a moment and study the art without reading the copy. Judging from the expressions on the faces of Monica and Druid, you can almost tell Macchio tried his darndest to hammer home how suddenly there was doubt, strife and borderline insurrection in the ranks. Now, on to the story at hand... Druid had summoned the team because a call came in on Captain America's special emergency hotline. This was a service Cap had set up for concerned citizens to report matters that might require his attention. With Cap unavailable, Druid decided the call merited the Avengers' attention and he proves to be right: thanks to a watchful neighborhood kid called Bobby, the team arrived in Ohio on time to catch the Fixer in the act of trying to acquire the Awesome Android. When Captain Marvel manages to get herself gassed by the Fixer, it's up to Druid to lead the team to victory... Which he does. "It's worth a try, doc!" 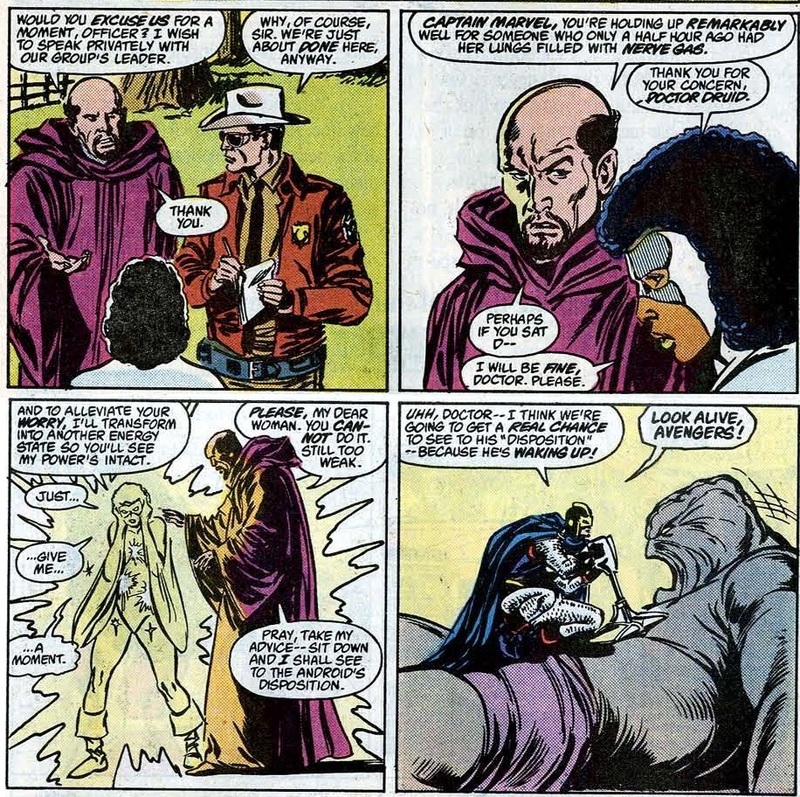 In the aftermath, Druid is seen helping the weakened Captain Marvel to her feet, while Monica is cursing him in a thought bubble for purposefully making her look weak. Avengers I#286 ends with the revelation that the Fixer was actually an unwitting accomplice and... Namor's lover Marrina has disappeared during the fight when she tried to stop a truck driven by the actual Fixer. Avengers I#287 opens with Namor chasing after Marrina and rescuing her, though the Fixer and his mysterious truck get away. Meanwhile, the Avengers have to deal with the Awesome Android again when it revives. 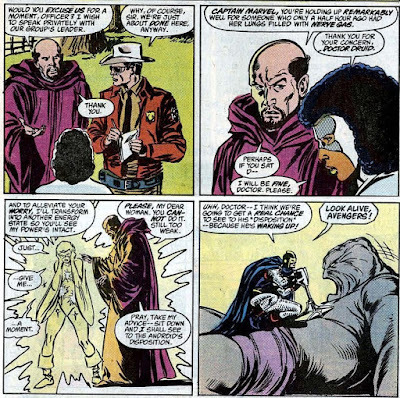 Once again, Dr. Druid's mental powers helped save the day while Captain Marvel was made to look weak and inconsequential. "Please, my dear woman. You cannot do it. Still too weak". Urgh... Talk about laying it on too thick. We get it, Ralph... Monica is a weakling who needs an older, more experienced member to back her up. Preferably a man. Even by 1987, the sexist and even racial undertones used to undermine Captain Marvel's credibility are baffling. It's no wonder Roger Stern refused to write her like this. You could argue Stern was so taken with Captain Marvel he made her a bit too wonderful and competent at times... But this is a complete 180. And we're not done. Soon after the Awesome Android is down, Druid proves yet again crucial to the story thanks to his telepathy. "Still feel weak. But I'm leader of the Avengers, right? Better assert myself." Urgh times two... Now Macchio has Monica reminding herself she's in charge. 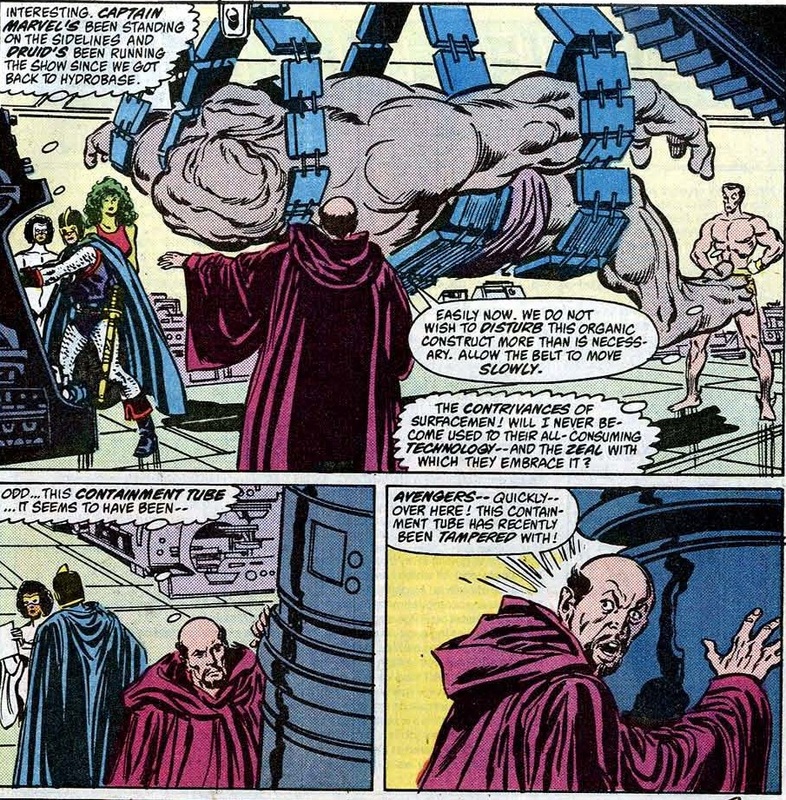 Still, it's once again Druid who is essential in tracking down Mentallo to one of Fixer's bases. Along the way, they encounter heavy opposition from the building's automated defenses. 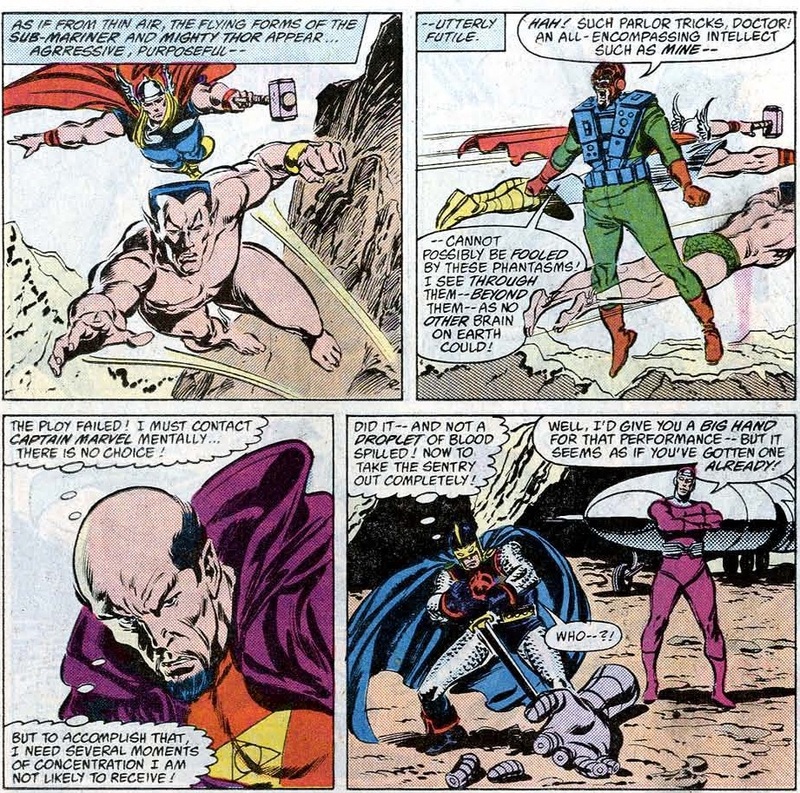 Yet, despite almost getting killed by giant turbines, the team manages to free and locate Mentallo who tells the Avengers his old partner has become something quite alien. 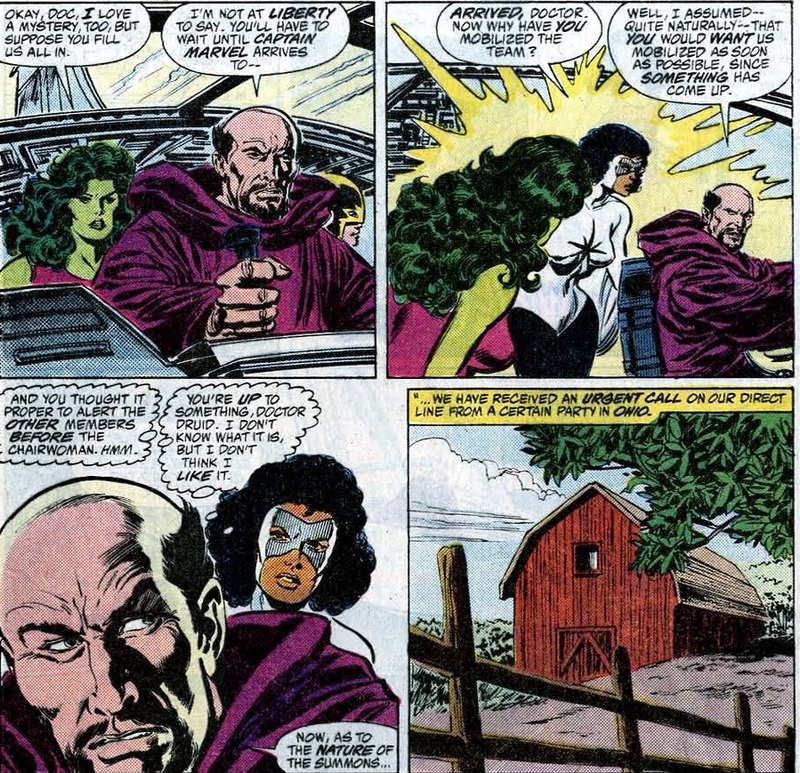 Druid's been running the show since we got back to Hydrobase"
Ah, another page, another dig at Monica Rambeau. What's even worse: Macchio makes sure we realize Druid is so much better at everything, it's almost embarrassing. Here, his powers figure out that the containment tube has been tampered with. Once they open it, they find... of all people... the Fixer? Yes, in a genuinely delightful nod to continuity, we learn the true identity of the Fixer that's just escaped from prison: it's the Super-Adaptoid. Created by AIM to fight its enemies, this superpower copying android was ultimately defeated and placed in suspended animation in a subbasement of the mansion. During the Masters of Evil recent invasion, the ever curious Fixer accidentally released the android and found himself replaced. "Please stop questioning my every move." 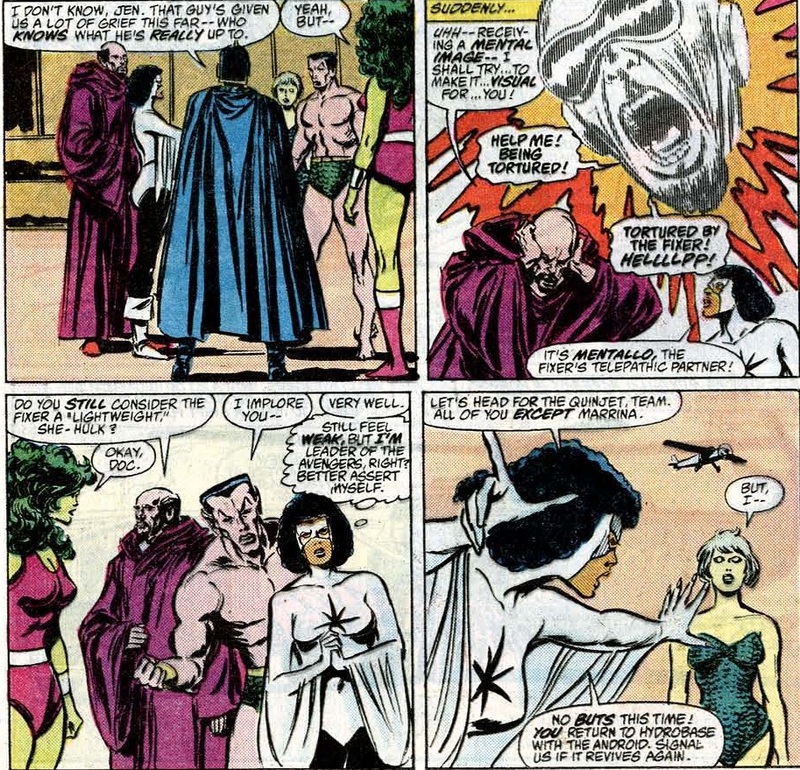 It's getting painful and tired at this point: not only is Namor the one overseeing the move, on the ground Druid is busy berating Captain Marvel for not hiring a film crew to record the event. Too many cooks spoil the broth and Monica is fed up with Druid's constant "helpful" suggestions. 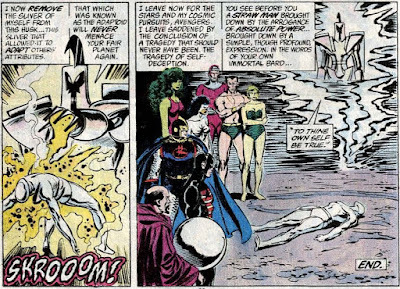 Moments later, the Avengers get a clue about the Adaptoid when the Black Knight comes in with a clipping from a small Texas newspaper (!) about escaping flying robots. 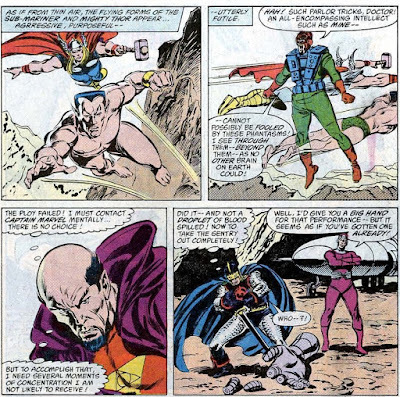 Correctly deducing the Adaptoid is apparently after other robotic lifeforms, Captain Marvel splits up the team and orders the Avengers to go and check on several likely candidates for recruitment. But Macchio can't leave well enough alone and has Captain Marvel feel overwhelmed by even this relatively simple task. "Sure wish Captain America would come back to us. I don't know if I'm cutting it with these folks." For heaven's sake... Can it still be considered "foreshadowing" when it's this blatantly obvious where the story is heading? It's almost an insult to the reader's intelligence. But, getting back to the star of the show: Doctor Druid was paired up with the Black Knight to visit a midwestern airforce base where the adamantium clad robot Tess-One is held. One teensy-tiny problem: the Avengers lost their security clearance a while ago when the Vision tried to take over the world. That's why the two heroes soon find themselves surrounded by soldiers who aren't exactly cooperative. But, to no one's surprise, Doctor Druid proves to be the solution to the problem... Even though morality takes a bit of a backseat. "You will lower your weapons and take us to the robot, Tess-One. 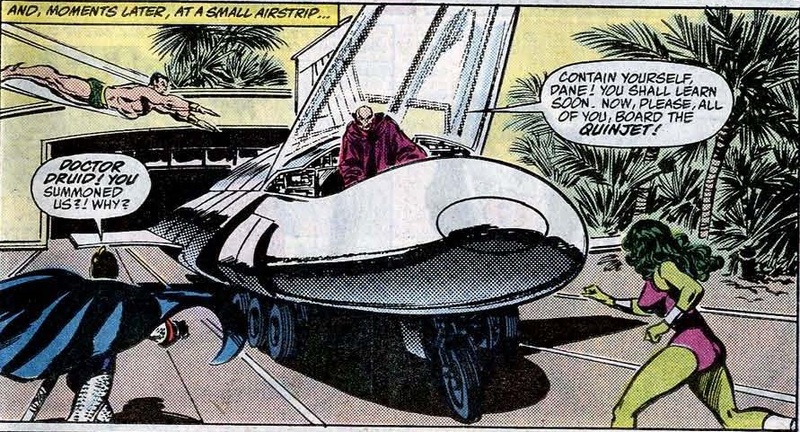 Shortly afterwards, Druid and Black Knight take off with Tess-One safely in the storage area of their Quinjet. Homeward bound, Macchio has Druid explain that the military mind is so used to receiving orders it leaves them more susceptible to telepathic commands. Even as a kid, yours truly felt this made perfect sense. On the way back, Druid slights Captain Marvel some more when the Black Knight mentions they weren't ordered to bring Tess-One back, only for the Doctor to point out that Monica lacked foresight in this matter. After all, they couldn't really have stayed on the base to see if if the Adaptoid would show up. And, as if on cue... he did, with help from his robotic recruits: Kree Sentry 459 and Machine Man. Though they attempted to fight the metal menaces off, Black Knight was quickly overcome and Druid's powers were of no particular use. And that's when Druid disappeared from the book for two issues. Left for dead after the fight, Captain Marvel rescued them behind the scenes and got them to a hospital. Meanwhile, the Adaptoid and his cybernetic compatriots launched a full scale attack on Hydrobase. 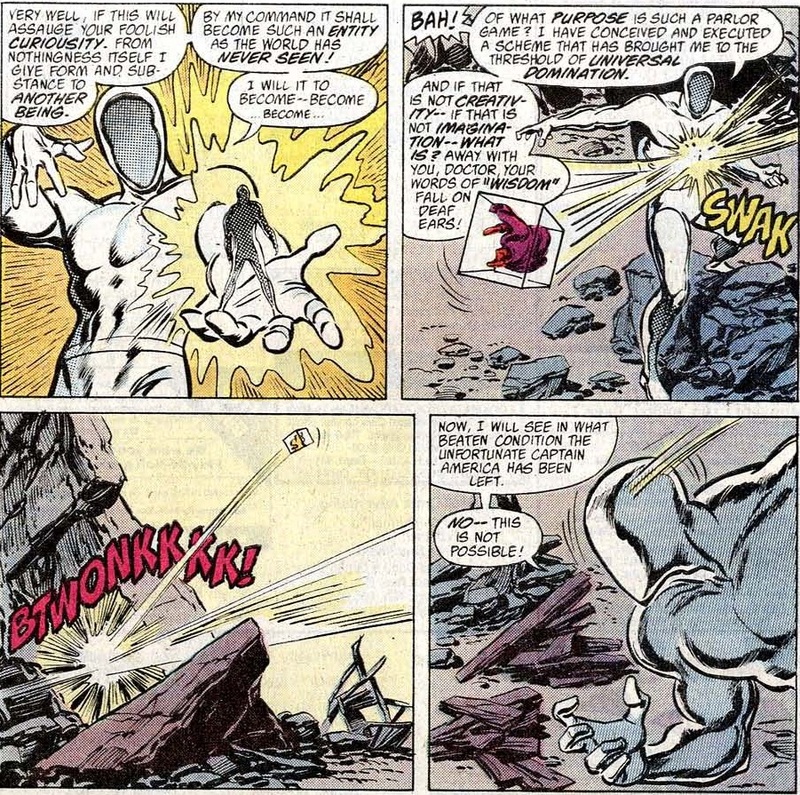 The real purpose for the ensuing slugfest was to buy the Adaptoid enough time to access the Avengers' computers. 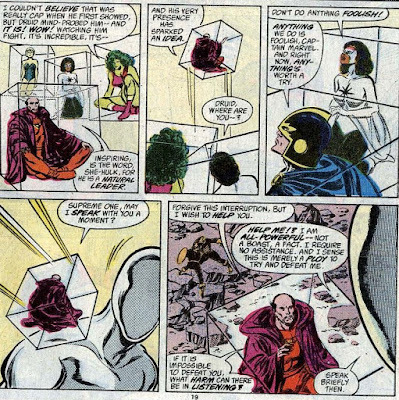 It wanted information on the Cosmic Cube, which the Adaptoid planned to make his dream of offspring a reality. Though he was a bit surprised when the cube showed up as Kubik, its more evolved sentient form, it didn't stop the Adaptoid from copying its cosmic powers. Now more powerful than ever, it decided to replace everyone on Earth with a copy of itself. 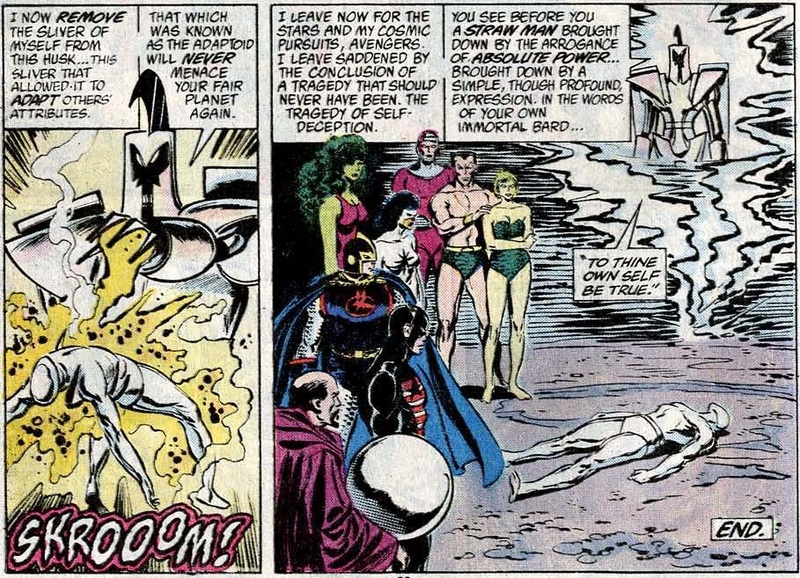 And that's when we catch up with Druid and Black Knight in Avengers I#290. to render this ship invisible that we may make a safe landing." Erm, how exactly is mentalism the solution here, Doc? You can use mass hypnosis to fool living beings, but against androids it's pretty darn useless. It's what got you beat up by the Adaptoid in the first place, remember? Also, take a moment to read the clunky chunk of exposition Macchio puts in Druid's mouth when he has him explain to the Black Knight where they'd been and how they'd gotten this Quinjet. Dane knows, Doc... he was right there! At any rate, they get attacked by androids who try to replace them. Because they're not actually alive, the Black Knight quickly chops them up with the ebony blade. This doesn't solve anything, because the loss of two of his "children" makes the Super-Adaptoid notice the heroes. He traps them inside invisible cubes along with the other Avengers who fill in Druid, the Black Knight and the readership. At the same time, Kubik decides to contact Captain America, who once helped it when it was still a Cosmic Cube. 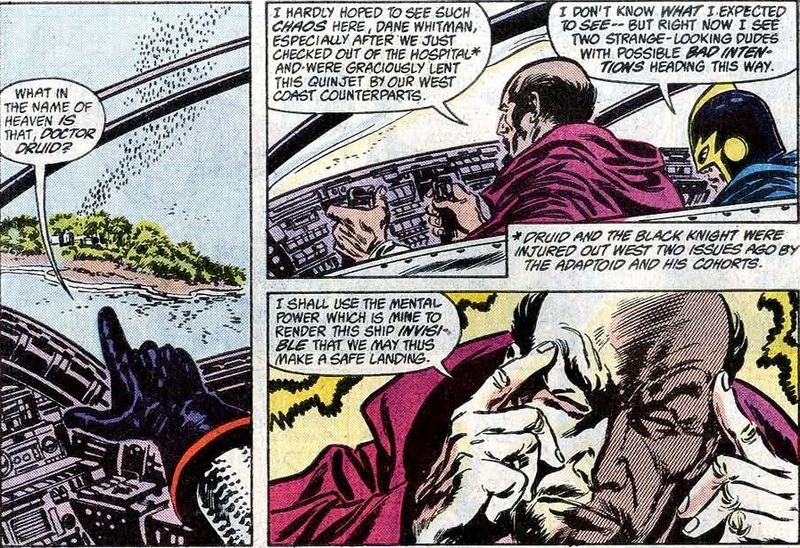 Though Steve is now working as the Captain, after the US government stripped him of his title, he agrees to be teleported to Hydrobase to help out. Though he's quickly captured as well, Rogers cleverly questions the Supreme Adaptoid's self professed sentience. 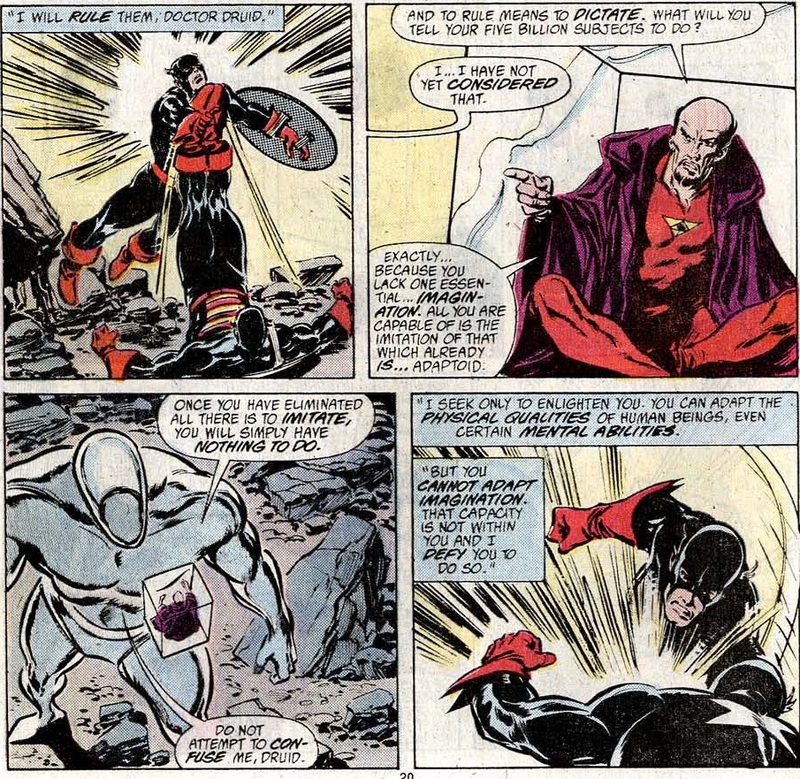 To prove a point, the Adaptoid frees Cap and lets him fight his intended replacement mano-a-mano. "Supreme one, may I speak with you a moment?" Now, while Ralph Macchio has caught considerable flack throughout this post for his portrayal of Druid and Captain Marvel, this is truly thought provoking material. 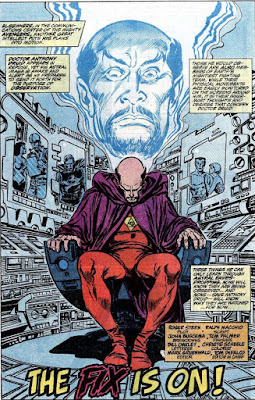 By now, he shared a co-plotter/writer credit with his old writing partner Mark Gruenwald. Together, they had Druid hand the Adaptoid a cunning conundrum which served as a meditation on the age old philosophical question of free will. "You lack one essential... Imagination. All you are capable of is the imitation of that which already is." Anyhoo, that's enough praise... the fight moves from engaging philosophical dilemma to Marvel's take on Rumpelstiltskin or Mr. Mxyzptlk. In other words: they tricked the villain into defeating himself. Facing the Captain in final combat, Steve Rogers managed to best the Adaptoid by taunting him to adapt to the one thing Rogers felt a machine couldn't: death. Never one to back down from a challenge, it ups and dies. And with that, the Avengers' Heavy Metal storyline was over. Macchio and Gruenwald gave Kubik some interesting parting words. When you read it, tis not hard to spot this was Macchio commenting on Stern being driven out or "brought down by the arrogance of absolute power", followed by that famous Shakespeare quote about remaining true to who you are: which Stern did when he quit the book rather than compromise on his original vision for the team. You might even reason that the Adaptoid was the perfect analogy for DeFalco's newly instituted "no real change/creativity" policy. All it could do was repeat variations of what it already knew, stuck in a perpetual, self repeating loop that would ultimately prove self defeating. 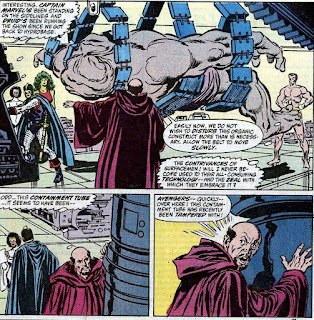 A year or so down the line, Steve Englehart would write a final Fantastic Four storyline in which he pretty much mocked Marvel's no-change rule by putting the actual FF in stasis and replacing them with clones who acted like it was still 1962, right down to insisting they had the exact same adventures. Ralph Macchio would bow out after #290 and make room for new regular writer Walt Simonson. 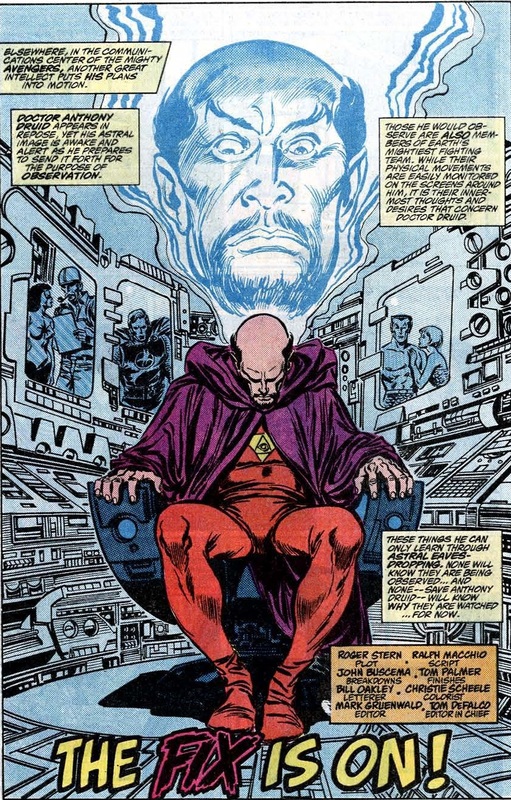 He would kick the deconstruction of the team into high gear and make Druid the centerpiece of the Avengers implosion of 88 as we'll see in part IV of The Dreadful Druid: The Doctor Is Out... Of His Mind. I hated how Monica Rambeau was undermined and turned into a buffoon in these stories. Roger Stern had has done such a good job with her, I would've happily read a solo comic.